Very rare indeed to see a General Steam Navigation coaster in Tilbury. Built in 1939 she was part of a large fleet , including the ROYAL DAFFODIL, ROYAL SOVEREIGN and QUEEN OF THE CHANNEL. 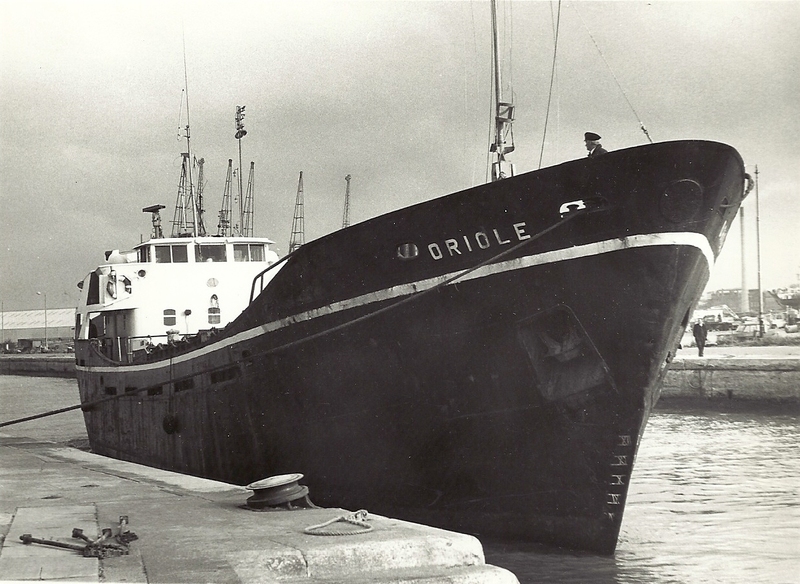 … … but it’s not ORIOLE dating from 1939, but the later namesake that was completed in December 1963 at Aberdeen. This ORIOLE was of 430 tons gross, 419 tons deadweight (low deadweight), and was owned by General Steam Navigation Co Ltd, London, whose cargo vessels were almost entirely named after birds. One of Jack’s photos of an older vessel that met its end at the Thos W Ward shipbreaking yard in Grays, the steamer PHILOMEL, on this site. ORIOLE was sold out of the GSN fleet in 1977 to start a role in North Sea offshore work under the name JUDERT, and five years later became JUDERT II, under the Panamanian flag, and owned by a Greek outfit. She did not last long after this change, for she was sunk following collision in the Mediterranean in March 1983. Her previous namesake did not fare much better, although she lasted longer. The older ORIOLE was sold by GSN in 1962, and after seven changes of owner and the same number of name changes, was a total loss in the Caribbean in 1991 under the name N D LOURDES.